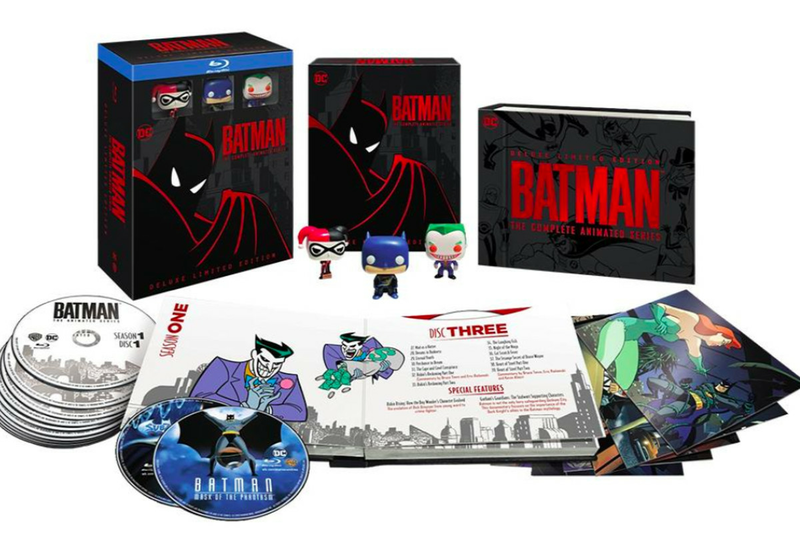 Final details have been released by Warner Bros. regarding the Deluxe Limited Edition Blu-Ray collection of Batman: The Animated Series. With news of the release of the series earlier in the year, we were left in the dark about what kinds of extra's we could expect in the new collection. Details of a Limited Edition wasn't even hinted at, by the company. In an official press release Warner Brothers finally gave up the details, not only will it be the 10 disc complete series totally digitally remastered it will also contain two bonus discs with exclusive new content. The Heart of Batman, a new documentary on the making and influences of the show, and much to the excitement of fans everywhere, the animated films, Mask of the Phantasm and Sub-Zero. In addition to the episodes and all the documentaries and commentaries included with the original DVD collections, the Deluxe Edition will have a few other awesome tidbits included. A set of 3 Batman: The Animated series themed Funko Pop! figures, Batman, Harley and the Joker, as well as seven art cards. The set will be limited to 30,000 copies and Amazon has already sold 2,000 on it's first day of offering the set. The only downside to this set is the price tag of $113. So there we have it, one of the most influential cartoons of all time will be released in an awesome set and hitting shelves on October 16th.